Unknown Bikes has thrown together a little promo! If you've been on the fence about these Unknown Bikes, now's a better time than ever to pre-order yourself a V2 frame. 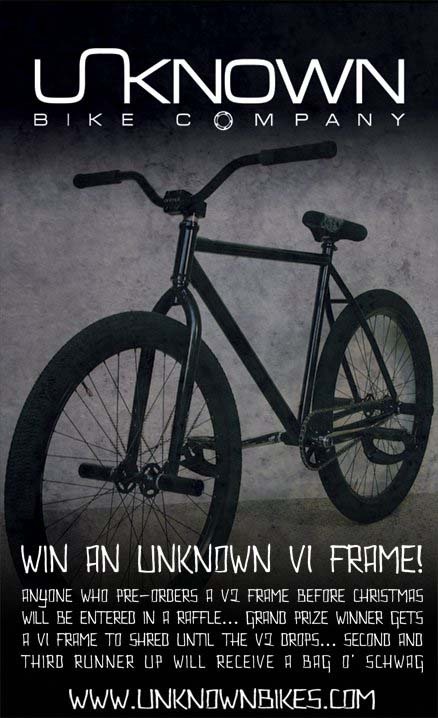 You could win a V1 frame to shred on while you wait for your pre-ordered V2 frame. One of the best pre-order deals I've ever heard of! Get at it here. What do you think about Unknown frames? Fat tires and good clearance, what's there to hate? I know that the dudes running Unknown are super nice people and take their riders' feedback seriously, so I'm sure the production models will be fine tuned pretty nicely.